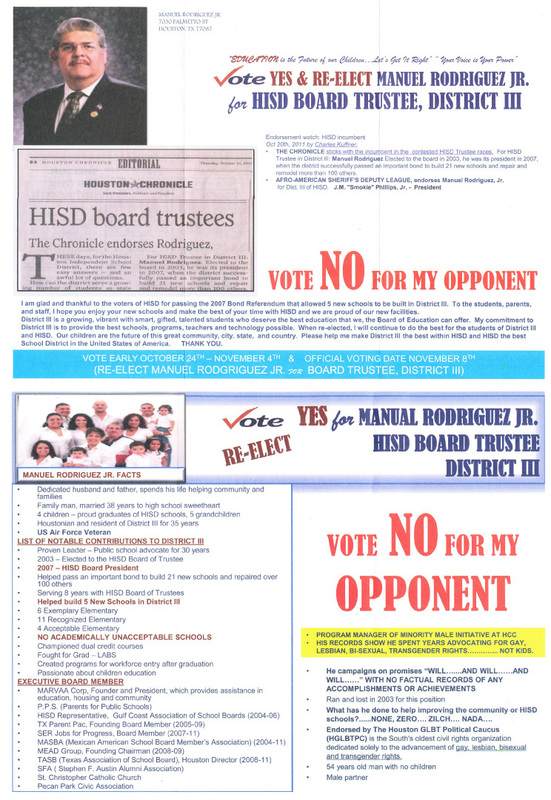 No one really cares much about Houston school-board elections, unfortunately, so incumbent Manuel Rodriguez Jr. was expected to win re-election because he wasn't indicted or anything. The Houston Chronicle endorsed him for re-election. But apparently he was nervous about his chances, or he just really, really hates gays. A flyer sent out in the last week of the campaign has done little but alert Democrats that Rodriguez is, apparently, more right-wing bigot than non-right-wing bigot. Oy, not to mention vey. With his hateful flier, Rodriguez perpetuates the kind of stereotypes that put our kids in danger. And he implies that all right-thinking people agree with him - an insult to his constituents, and precisely the kind of blithe, old-school homophobia that makes school hallways so treacherous.